Here's my effort from this afternoon. Several weeks ago, I painted a group of pears on a cloth with a goal of brushing the paint on just once with no blending of my colors. It wasn't as successful as I had hoped, but today, I pulled it off! 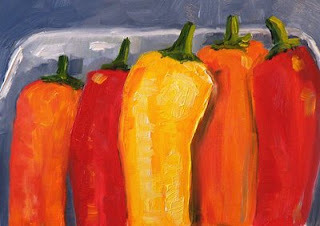 Each color of the tangerine and the background was brushed once--no second swipe, no blending--it worked great! I struggled a little to leave the paint on the stem and leaves alone, but overall, I am pleased with the results of my effort. When it dries, I will probably sell it in my Etsy Gallery where I sell my small paintings. My larger works are for sale in Impressions Gallery at 1000 Markets. This painting is a 5x7 inch oil painting on a gessoed hardboard panel. Today's 8x10 inch oil painting was based on a photo I took last summer at Point Defiance Park in Pierce County, Washington State. It was late evening, the sun was dropping, and the shadows were getting very long. My husband and I sat on a grassy hillside watching park visitors loung on the grass below. I took pictures, made some value studies, and he read the paper. It was a delightful summer evening with a warm breeze after a hot afternoon. Creating this painting was a soothing reminder of warm days coming again in just a few short months. I can't wait! 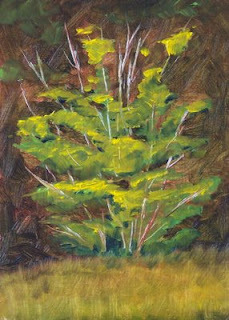 This little 5x7 inch tree painting is one I created in 2007; it is one of my favorites. My favorite paintings are often snapped up by collectors, and while I'm happy about the sales, it is a little sad to say good-bye to these little friends. This one is based on a small Vine Maple Tree at Snake Lake Nature Center in Pierce County, Washington State. The painting has been in my Etsy Gallery for almost a year. The listing will be expiring in a few days. When it does, if no one has purchased it, I'm going to frame it in a beautiful, very expensive frame and keep it for myself. A few days are left before I take it off the market. In the mean time, if you would like to make this little jewel a member of your family, it is still available for purchase for $50.00 plus $6.50 for shipping to US addresses. Click here to purchase. I'll be a little sad, but it is nice to see my little works find new homes. Today's painting was an experiment with a new tube of paint. Recently I purchased a tube of Windsor and Newton's Terra Rosa. Beginning with a black panel, I blocked in my shapes. 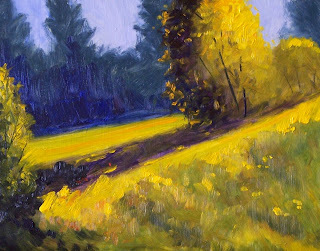 In addition to Terra Rosa, I used Cadmium Orange, Ultramarine Blue, Titanium White, and Naples Yellow as highlights in the grass and to represent some of the leaves. I liked the way the Terra Rosa mixed with the orange and white. It is a strong, opaque color and I'm glad to add it to my collection of paints. When this little 5x7 inch painting dries, I will probably sell it in my Etsy Gallery along with some of my other tree paintings. 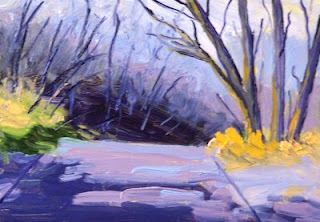 This 5x7 inch small format oil painting was created last fall as part of an art challenge in the online forum, Wetcanvas. 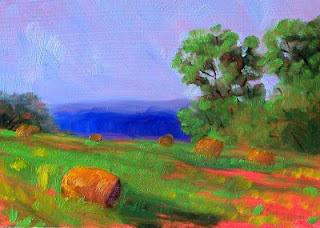 The original photograph from which this painting was created was a Tennessee hay field. Although Washington State is the other side of the country, I could imagine a very similar view here in the Pacific Northwest. This painting is now for sale in my Etsy Gallery where you can view closeups . For $50.00 plus $6.50 for shipping to US addresses, this painting can move from my studio to your home. Click here for sales information. Other small paintings of fields are available in the Fields Section of my Etsy Gallery. Click here to visit. 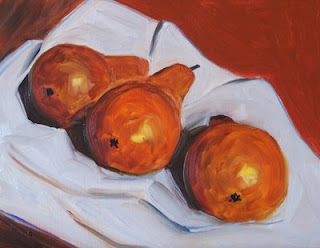 When I painted these pears, my goal was to put down bold strokes of color and avoid blending, letting my eye blend for me. I wasn't very successful. My brush and my hand slid together more often than not. Although I'm not unhappy with the results, my original plan fell apart. I'd like to try it again, but use opaque color rather than the transparent colors I used for most of this one. Opaque colors may lend themselves better to my plan. When the painting dries, it will probably enter Impressions Gallery at the Artists Collective at 1000 Markets and find a new home. 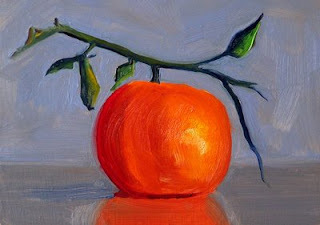 This 5x7 inch oil painting was created earlier this month on ¼-inch recycled hardboard panel. When I paint, my efforts are sometimes scraped off and the board is recycled into a new painting. I love the texture left by previous layers of paint and these recycled efforts often turn out well. This painting is now for sale in my Etsy Gallery for $50.00 plus $6.50 for shipping to US addresses. Click here to purchase or view closeups of the texture and brush strokes. 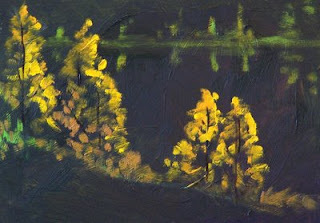 Other paintings of trees or water and reflections are also available in my Etsy Gallery. The Skagit Valley of Washington State has a yearly Tulip Festival that draws people from all over the area to the fields of tulips, but another festival worth mentioning is the Puyallup Valley Daffodil Festival in Pierce County of Washington State. The Daffodil Festival began in 1933 as a tribute to the flower industry. Sumner, Washington in the Puyallup Valley is home to numerous daffodil fields. Bulbs flourish in the damp, rich soil that resulted from the last eruption of Mount Rainier, a dormant volcano south of the valley. 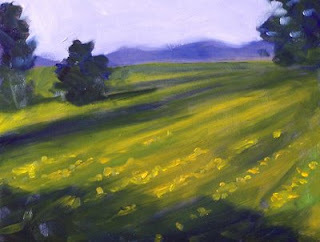 This 8x10 inch oil painting celebrates the golden beauty of the daffodil fields of the Puyallup Valley. This weekend was spent at the coast. It was a lovely four days and I discovered how easy it is to slip into vacation mode. I painted daily, but also walked the beach, rode my bike, and began reading a fat novel. Periodically a Bald Eagle purched on a pole behind the house and kept a check on the field mice. This morning a pair of deer pranced around with the scent of spring in their nostrils, running in circles, leaping, and chasing. While the sun was out, I snapped pictures of the winter dune grass and attempted to recreate the warmth of the sunshine and shadows that are part of the Pacific Coast landscape. This 8x10 inch oil painting is one of my paintings from the weekend. Soon the sunshine and warmth will turn the golden grass of winter into the green of spring. Greens are difficult to manage with my artist's palette, so I'm glad I captured the grass while it is still a manageable golden hue. 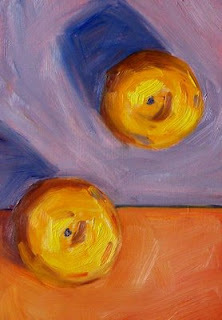 This 5x7 inch oil painting is one of my favorite perspectives for painting fruit, a bird's eye view. The perspective produces an abstration that is fun an appealing. While painting this little study, I worked on values and loose brush strokes. For closeup views of the painting that exhibit detail of the texture and brush strokes, you can visit the listing for this painting in my Etsy Gallery. The painting can be purchased for $50.00 plus $6.50 for shipping to US addresses. I also ship internationally. Visit the listing for quotes on international shipping. It snowed again today. I'm tired of rain, snow, and slush, so I decided to put some color out in the world. This 5x7 inch oil painting is dry and ready to brighten someone's life. Placing it here on my blog and for sale in my Etsy Gallery makes me feel better about the never ending cycle of cold and wet. Closeups of the texture and brush strokes can be seen by visiting here. The painting can be purchased for $50.00 plus $6.50 for shipping to US addresses. International shipping prices are available in the listing. Click here for details. 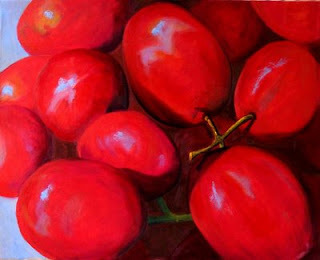 Some of my other small paintings of fruits and vegetables are here. 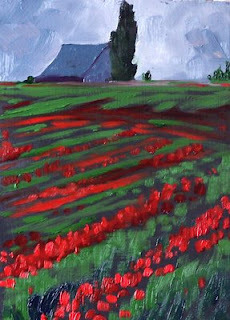 This 5x7 inch oil painting was inspired by rain on the tulips in the Skagit Valley of Washington State. Every spring the flower growers host the Skagit Valley Tulip Festival. This year you can visit between April 1st to April 30 and, if mother nature cooperates, you will see lovely tulips and daffodils. Tours are available for a number of the local tulip farms. Wear a rain coat, take your umbrella, and then pray for sunshine. You never know what weather will greet you in the Pacific Northwest. This painting is for sale in my Etsy Gallery this week and can be purchased for $50.00 plus $6.50 for shipping to US addresses. Click here to see closeups of the brush strokes and texture. After yesterday's mishap with my glasses and several disasterous painting starts, I dug around the house and found an old pair of glasses that will help me get by until I can get a new lens. They are scratched and bent, but at last I can see again! 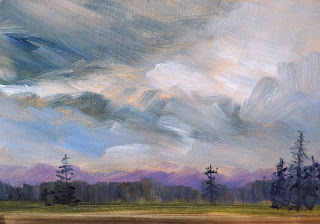 I was able to create this little 5x7 oil study inspired by the rainy weather of the Pacific Northwest. Difficulty struck today. This morning I went out with my family to a nearby dog park. When I returned I discovered that I had lost one of the lenses from my glasses. I use them for reading or when I paint. It was awkward. I used a pair of cheap drugstore glasses, but it felt uncomfortable and off. I'm not sure how I feel about this little 5x7 created in my impaired state. 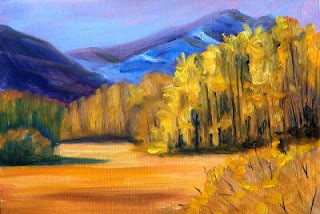 The painting was inspired by a rare sunny day after weeks of rain and gloom. I walked the Soundview Trail near my home. It is a delightful trail that winds its way around the Chambers Bay Golf Course, down to Puget Sound, and back up the hill again. The trees were bare, but the sun warmed the road and the winter grass making me anxious for spring. I think it is finished. I've been glazing away on this painting for weeks. A number of thin layers of oil paint made creating his painting a lengthy task. As each layer was added, I waited a week for it to dry before adding a new layer. Needless to say, it has been at least a month since I began working on this one--I lost track of when it was actually begun. The painting is 16x20 inches on stretched canvas. When this final layer dries, it will be for sale at my gallery at 1000 Markets. 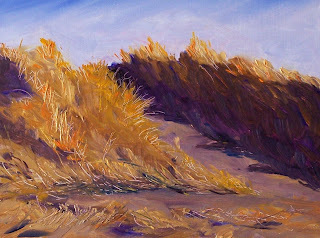 Until then, you can click here or here to view some of my other sill life oil paintings. I spent most of the day working on two larger paintings. Though neither of the larger paintings is complete, I was able to list this little 5x7 inch tree painting in my Etsy Gallery. I like the contrast of the green and gold and the warmth of the grassy field. It can be purchased for $50.00 plus $6.50 for shipping to US addresses by clicking here. Once again, I am out of season. 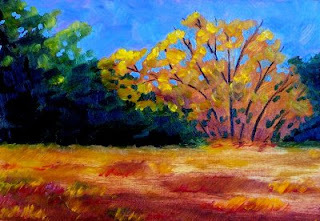 It is my love of autumn color that keeps me painting the fall season. 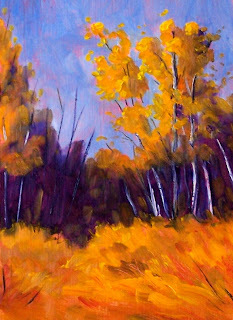 What I liked best about this painting was the contrast between the purple and the golden colors of fall. This painting is for sale in my Etsy Gallery along with a number of other tree paintings. It can be purchased for $50.00 plus $6.50 for shipping to US addresses by clicking here. I'm a little out of season here. In February I should probably be posting a winter scene, but the cold dampness of the current season doesn't inspire me nearly as much as the seasons of color and sunshine. This little 5x7 inch painting is now available for purchase at my Etsy Gallery for $50.00 plus $6.50 shipping to US addresses. Click here to purchase or see closeups. I'd like to see someone treat him or herself to a little work of art on this first day of February. More small paintings of trees and fields available my Etsy Gallery, Small Impressions Paintings. 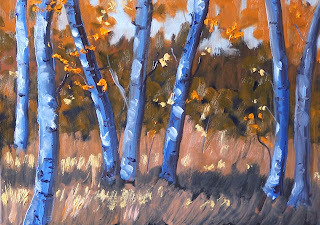 My larger tree paintings are available at Impressions Gallery at the Artists Collective in 1000 Markets.